Lily is the common name for any of the herbaceous flowering plants comprising the genus Lilium of the Liliaceae family, characterized by large flower with six tepals, leafy stems, linear leaves, and normally growing from underground bulbs from which they overwinter. There are about 110 species in the genus, widely distributed in the Old World (Europe, Asia, Mediterranean region) and New World (North America). The name lily also is used for the flower of any of these species. While members of the genus Lilium are the "true lilies," there are many other plants that use the common name lily, including some that are quite unrelated to the true lilies. Water lilies comprise the family Nymphaeaceae, and the calla lily is in the genus Zantedeschia of the family Araceae. The sego lily and mariposa lily are members of the genus Calochortus, which sometimes is placed in Liliaceae, but sometimes in a separate family Calochortaceae. The name lily also serves as a collective name for the entire Liliaceae family, which is known as the lily family. This article will be limited to the true lilies of the Lilium genus. Typically having large, showy flowers, and offering a diversity of colors, lilies are popular and economically important as ornamental plants, being planted in gardens or used as cut flowers. They are important culturally and in literature in much of the world. There also are species that are sometimes grown or harvested for the edible bulbs as well. Ecologically, the large, colorful flowers (and large organs and sometimes colorful pollen) serve to attract large pollinators such as bumblebees and hummingbirds, providing them a food source (pollen and nectar) in exchange for pollination of the plants. 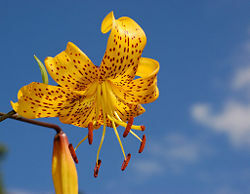 Thus, the large flowers not only advance lilies' individual function of reproduction, they also provide a larger function for the ecosystem and for humans. Liliaceae, the "lily family," is a family of monocotyledons in the order Liliales. Plants in this family have linear leaves, mostly with parallel veins but with several having net venation (for example, Cardiocrinum, Clintonia, Medeola, Prosartes, Scoliopus, Tricyrtis), and flower parts arranged in threes. Lilies, comprising the Liliaceae genus Lilium, are leafy stemmed herbaceous plants. Most species are deciduous, but a few species (Lilium candidum, Lilium catesbaei) bear a basal rosette of leaves during dormancy. Lilies form naked or tunic-less scaly underground bulbs from which they overwinter. In some North American species, the base of the bulb develops into rhizomes, on which numerous small bulbs are found. Some species develop stolons. A few species form near the soil surface. Many species form stem-roots. With these, the bulb grows naturally at some depth in the soil, and each year the new stem puts out adventitious roots above the bulb as it emerges from the soil. These roots are in addition to the basal roots that develop at the base of the bulb. Orange Lily showing stamens with pollen-covered anthers. 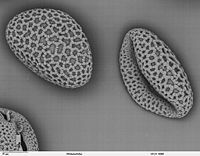 Pollen of Lilium auratum (Oriental Lily) Back-scattered electron microscope image. The large flowers have six tepals. Tepals are elements of the perianth, or outer part of a flower, which includes the petals or sepals. The term tepal usually is used when all segments of the perianth are of similar shape and color, or undifferentiated. When different types of organs can be distinguished, they are referred to as petals and sepals. The flowers of lilies are often fragrant, and come in a range of colors ranging through whites, yellows, oranges, pinks, reds, and purples. Markings include spots, brush strokes, and picotees. The plants are summer flowering. The botanic name Lilium is the Latin form and is a Linnaean name. The Latin name is derived from the Greek leirion, which is generally assumed to be the Madonna lily (LilyNet 2001). Some species formerly included within this genus have now been placed in other genera. These include Cardiocrinum, Notholirion, Nomocharis, and some Fritillaria. The range of liles in the Old World extends across much of Europe, the north Mediterranean region, across most of Asia to Japan, south to the Nilgiri mountains in India, and south to the Philippines. In the New World they extend from southern Canada through much of the United States. Lilies are popular as ornamental plants. Many species of lily are widely grown in the garden in temperate and sub-tropical regions. Sometimes they may also be grown as potted plants. A large number of ornamental hybrids have been developed. They can be used in herbaceous borders, woodland and shrub plantings, and as a patio plant. Lilium bulbs are starchy and edible as root vegetables, although bulbs of some species may be very bitter. The non-bitter bulbs of L. lancifolium, L. pumilum, and especially L. brownii (Chinese: 百合 干; pinyin: bǎihé gān) are grown at large scale in China as a luxury or health food, most often sold in dry form. They are eaten especially in the summer, for their ability to reduce internal heat. They may be reconstituted and stir-fried, grated, and used to thicken soup, or processed to extract starch. Their texture and taste draw comparison with the potato, although the individual bulb scales are much smaller. Although they are believed to be safe for humans to eat, there are reports of nephrotoxicosis (kidney failure) in cats which have eaten some species of Lilium and Hemerocallis (Langston 2002). Species (Division IX). All natural species and naturally occurring forms are included in this group. Asiatic hybrids (Division I). These are plants with medium-sized, upright or outward facing flowers, mostly unscented. They are derived from central and East Asian species. Martagon hybrids (Division II). These are based on L. martagon and L. hansonii. The flowers are nodding, Turk's cap style (with the petals strongly recurved). Candidum hybrids (Division III). This includes hybrids of L. candidum with several other mostly European species. American hybrids (Division IV). These are mostly taller growing forms, originally derived from L. pardalinum. Many are clump-forming perennials with rhizomatous rootstocks. Longiflorum hybrids (Division V). These are cultivated forms of this species and its subspecies. They are most important as plants for cut flowers and are less often grown in the garden than other hybrids. Trumpet lilies (Division VI), including Aurelian hybrids. This group includes hybrids of many Asiatic species, including L. regale and L. aurelianse. The flowers are trumpet-shaped, facing outward or somewhat downward, and tend to be strongly fragrant, often especially night-fragrant. Oriental hybrids (Division VII). These are based on hybrids of L. auratum and L. speciosum, together with crossbreeds from several mainland Asiatic species. They are fragrant, and the flowers tend to be outward facing. Plants tend to be tall, and the flowers may be quite large. 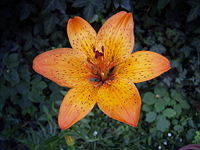 An example is Lilium "Stargazer." Other hybrids (Division VIII). Includes all other garden hybrids. Langston, C. E. 2002. Acute renal failure caused by lily ingestion in six cats. J Am Vet Med Assoc. 220(1): 49-52, 36. PMID 12680447. Retrieved December 23, 2008. LilyNet. 2001. Classification. LilyNet. Retrieved December 23, 2008. Taxonomical division in sections follows: Comber, H. 1949. A new classification of the genus Lilium. Lily Yearbook. Royal Hortic. Soc., London. 15: 86-105. Taxonomy basically from: Govaerts, R. 2006. World Checklist of Liliaceae. The Board of Trustees of the Royal Botanic Gardens, Kew. Retrieved December 23, 2008. Taxonomy of Section Pseudolirium from: Flora of North America, Vol. 26. Retrieved December 23, 2008. Taxonomy of Section Liriotypus in consideration of: Resetnik, I., Z. Liber, Z. Satovic, P. Cigic, and T. Nikolic. 2007. Molecular phylogeny and systematics of the Lilium carniolicum group (Liliaceae) based on nuclear ITS sequences. Plant Systematics and Evolution 265: 45–58. Taxonomy of Chinese species (various sections): Flora of China, Vol. 24. Retrieved December 23, 2008. Taxonomy of Section Archelirion in consideration of: T. Nishikawa, K. Okazaki, K. Arakawa, and T. Nagamine. 2001. Phylogenetic analysis of section Sinomartagon in genus Lilium using sequences of the internal transcribed spacer region in nuclear ribosomal DNA. Breeding Science (育種学雑誌) 51(1): 39-46. Retrieved December 23, 2008. Taxonomy of Section Archelirion in consideration of: T. Nishikawa, K. Okazaki, and T. Nagamine. 2002. Phylogenetic relationships among Lilium auratum Lindley, L. auratum var. platyphyllum Baker and L. rubellum Baker based on three spacer regions in chloroplast DNA. Breeding Science (育種学雑誌): 52(3): 207-213. Retrieved December 23, 2008. This page was last modified on 23 July 2018, at 14:01.